This version doesn’t add much new functionality but does fix a bug whereby files could not be edited in the theme/plugin editors while the plugin was installed. Thanks go to Florent for pointing that one out. I strongly advise all users to upgrade as soon as possible. This also includes the functionality to place searchforms in page and post content. See the presets section (Settings > WP Custom Fields Search) for an example tag. Thanks go to Ibrahim for the suggestion. This is my search plugin for wordpress, designed to filter posts in a more structured way than the default wordpress search. 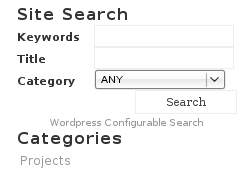 Specifically it allows multiple form inputs to be configured to search different aspects of a post, i.e. one term could search the post content, one the post title and one could search a custom field associated with the post. This is a search plugin with which you can build a customised search form. It allows you to search custom fields, choose multiple search parameters and choose HTML form elements to represent them.